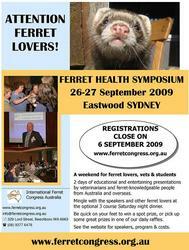 Welcome to IFCA (International Ferret Congress Australia). We are not a ferret club or forum, we are a group of ferret lovers who have organised several Ferret Symposiums (conferences) in Australia to share knowledge & experience about ferrets. Past Symposiums were held in 2008 (Melbourne) and 2009 (Sydney). There are not currently any plans for future events.